Equipment is 185” wide x 95” deep with a 172” swing height. Side load design discharges container 90° to the left of the load side. Lift & Seal System™ hydraulically docks container to pour hood inlet for sealed product discharge. Unit rotates 180°, docking pour hood mounted slide gate to stationary hopper fill hood at 80” above floor level. 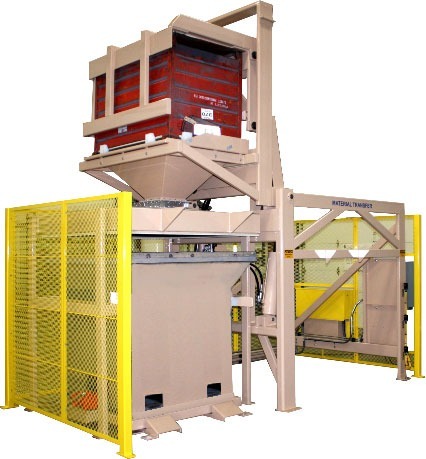 Fill station includes pneumatic air bag lifting system, lifts and docks receiving hopper to hopper fill hood for dust-tight material discharging and filling. Receiving hopper sits on settling table with electric vibrators to de-peak material. Safety features include three (3) sides of flattened expanded machine guarding and three (3) photo-electric sensors on load side of unit. 5 HP, 5 GPM Parker hydraulic pumping unit with MTS exclusive two-speed hydraulic circuit.